Patron is a sweet, 16,1 hands, chestnut Thoroughbred gelding, by Parading out of a Danzig mare, Patron came to us via the CARMA for Horses Placement Program. 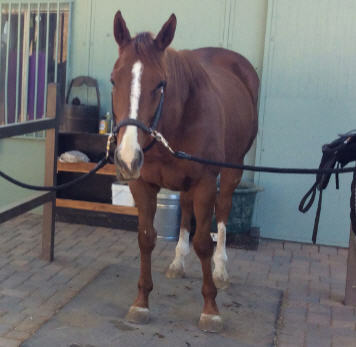 He is a 4 year old, (2011) and very flashy, with a beautiful white blaze face and 2 white hind stockings. Goes out alone, no spooks. We think he is darn close to being bomb proof. He has put on a lot more weight after this picture was taken.. Excellent manners. Clips, ties, trailers and stands.